Cooler weather leads to sweaters and scarves- learn how to make a cowl scarf from flannel fabric complete with bound buttonholes and large buttons. In this tutorial you will see how to make a cowl scarf from flannel fabric while learning how to properly cut out and sew together stips of flannel as well as how to make an easy version of a bound buttonhole to complete your cowl- Ashley Hough shows you how. For this cowl, Ashley explains that it is meant to be long enough to wrap around your neck twice and then button. This comes out to be 60” of fabric. Ashley explains that most flannel fabric has only around 41” of workable width, meaning you will need to sew together two strips of fabric. 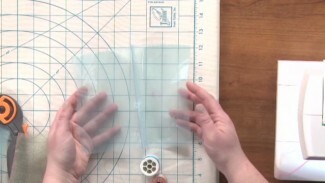 Ashley demonstrates how to determine how wide of strip to cut depending on how wide the pattern repeat is on your fabric. For her cowl, Ashley uses a width of 11”. You will want your width to be similar, however you may have to adjust up or down by an inch or so depending on your fabric. She then shows how to properly cut the flannel fabric using scissors. 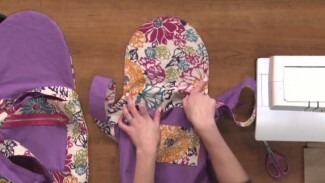 Ashley explains that it is the same technique you would want to use with any similarly printed fabric. 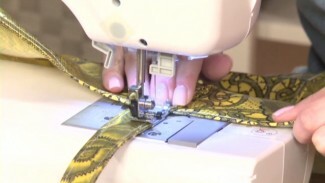 Once you have your strips cut out, Ashley shows how to match up the patterns of the fabric and sew them together. To create the cowl you would then simply sew the 11” x 60” rectangle of fabric together with a lining rectangle of the same size. To make this project slightly different, Ashley shows how to make a cowl scarf that is held together with two buttons and bound buttonholes. She demonstrates the bound buttonhole technique on cotton fabric, making it easier to see and follow along. 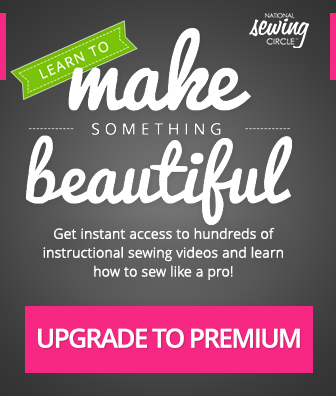 She also explains what size of buttonhole to make depending on the buttons you have selected and the thickness of your fabric. Once you’ve mastered this fun cowl learn how to sew an infinity scarf.